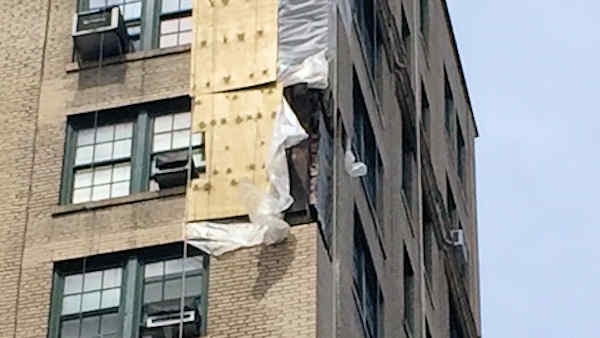 UPPER WEST SIDE, Manhattan (WABC) -- The FDNY and Department of Buildings are investigating after bricks fell from the facade of an Upper West Side building Monday morning. The incident happened around 10:45 a.m. at the building on West End Avenue between West 93rd and West 94th streets. It appears the building facade was being repaired in some fashion, and it appears the debris landed on scaffolding and netting set up around the building. Fire officials say it appears rain may have loosened some of the bricks, and that some other bricks may need to be removed if they've been loosened. No injuries were reported, and no residents have been evacuated. West End is closed between 93rd and 95th streets.